The combination of a smooth and creamy custard and sweet coconut is what I call incredible! Then top it with a light fluffy meringue....oh my! 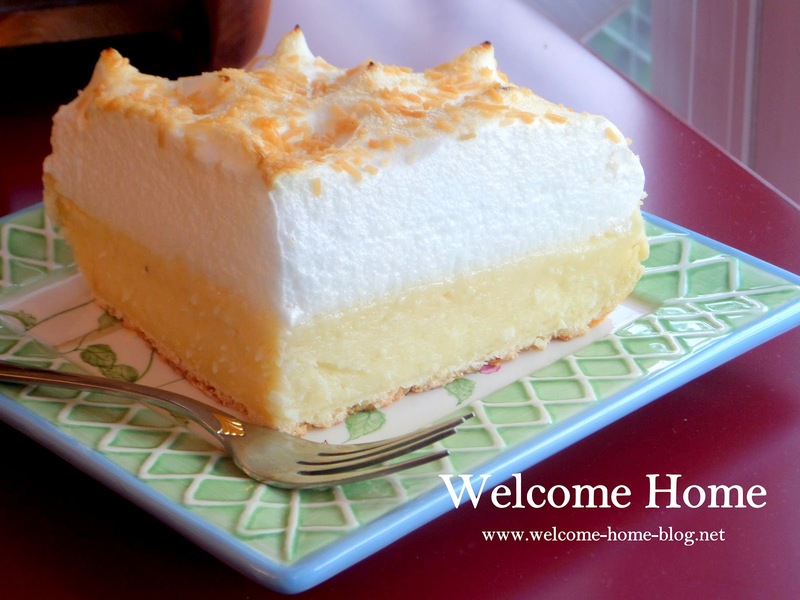 I loved this pie when I was little and my Mom could make meringue that stood up so tall! She taught me all the tricks to making "mile-high" meringue. I will share them with you at the end of the recipe. Preheat oven to 400 degrees. Roll out pastry into a 12 inch circle. Fit into a 9 inch pie pan and fold edge under. Then line the pastry shell with a sheet of foil and fill with dried beans or pie weights. Set pie pan on baking sheet and bake 10 minutes. Remove weights and foil and bake another 5 minutes until bottom firm and light golden, Cool on a rack. I usually brush my crust with an egg white and a little water before baking to keep it from getting soggy. Filling: Preheat the oven to 350 degrees F. Then spread 3/4 cup of the coconut on a baking sheet and then place your baking sheet in the oven and bake your coconut for 5 minutes or until its golden brown. You will need to stir your coconut around occasionally. When done, transfer your toasted coconut to a plate and let it cool a bit. To make the custard, whisk together the sugar, cornstarch, salt and milk until smooth in a heavy large saucepan. Cook and stir the mixture over medium-high heat until thickened and bubbly. You will then want to reduce the heat and cook while stirring for 2 minutes longer. Remove the saucepan from the heat and then stir in a small amount of hot mixture into a bowl that you have beaten your eggs in. This is called tempering the eggs and you do it so that you don’t create scrambled eggs in your mixture. Once the eggs are tempered add in your egg mixture to the saucepan and bring it to a gentle boil and cook for an additional 2 minutes. Your next step is to remove the saucepan from the heat and then gently stir in your toasted coconut, butter and vanilla extract. After your custard has cooled slightly you will want to pour your custard into the pie shell that you have already baked. Set your pie aside to cool while you make your meringue topping. Use spatula to create peaks all over meringue and sprinkle with the toasted coconut. Place the pie into your preheated oven and bake at 325 degrees or until the meringue is golden brown. This should take 20 minutes. Keep an eye on it to make sure that the coconut you sprinkled on top doesn't burn. Then cool on a wire rack to room temperature. YUM!